Yellow flag iris is an aquatic invasive plant found in Lincoln County that readily impairs wetlands, rivers and streams. These aquatic habitats are critical to numerous sensitive fish and wildlife species, which makes control of yellow flag iris particularly challenging. Yellow flag iris is classified as a State Listed B noxious weed and is considered an Early Detection Rapid Response (EDRR) species and should be reported to LSWCD and the Oregon Invasives Hotline. Lincoln County its relatively sparse presence make it a priority species for early detection and control. Currently the ISCP is inventorying infestations of yellow flag iris within rivers, streams and wetlands throughout Lincoln County. If you know an infestation contact our Program Manager (541-265-2631). Yellow flag iris is the largest (up to 5-6 ft) iris species found in Lincoln County, towering over any other varietals and natives. It is a perennial native to Europe that was introduced as a garden plant, and a water treatment species (accumulates heavy metals) in the United States. It spreads by dislodged fragments of its underground rhizome (see photo below) or by its corky seeds that can float. During late spring months its yellow flowers are a good identifier. A good place to see this species in Lincoln County is at Brian Booth State Park, formerly known as Ona Beach State Park. Why is yellow flag iris a problem? Yellow flag iris is a very large and aggressive species that grows quite successfully in standing water such as in wetlands and streams. It's dense growth habit rapidly out-competes and excludes the native vegetation that wetland wildlife are dependent upon for food and shelter. 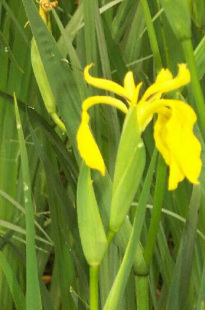 In small and swift moving streams, yellow flag iris can consume waterways and alter flow patterns leading to flooding. Yellow flag iris is not a food source for wildlife and actively excludes native food sources such as sedges and rushes. Yellow flag iris is very difficult to control due to it's expansive root system that deeply penetrates the soil substrate. Removing all portions of the roots and rhizomes is necessary for manual control. But without caution, digging can lead to the spread of rhizome fragments. Herbicide application to control yellow flag iris should be conducted by a licensed applicator, due to treatment occurring in and around water. To prevent your yellow flag iris infestation from spreading throughout the watershed flowers and leaves prior to seed set. Although due this with caution, because the sap within the tissue of this plant has the potential cause temporary skin irritation.